The uniquely designed Ball canister (formerly DC39) is a full sized vacuum cleaner that can handle entire households with a variety of floor types. It comes in their Multi-Floor configurations, complete with a variety of attachments as well as the extreme suction power that Dyson is known for. The main attachment is their Triggerhead turbine tool, which picks up pet hair as easy as it does dust. You can easily move from carpet to smooth floor by using the trigger to turn the spinning brush bar off. The brush is activated via an air switch inside the pathway so there are no electronics necessary, just the power of the motor. When buying a new vacuum you want one that has whole machine HEPA filtration, and Dysons are certified by the Asthma and Allergy Foundation of America (AAFA). This means they remove almost all of the microscopic allergens like dust mites and pet dander, down to 0.3 microns in size. And it all starts with the filter. Most other cleaners have inefficient filters which allow some particles like mold spores to just pass right through, only to be pushed back into your home. Dyson has a fully sealed system that prevents this from happening. Their Radial Root Cyclone™ technology uses extreme suction and a unique interior pathway that doesn’t allow dirt to settle anywhere along the way. The Ball is very efficient and will not clog during operation. Many people who consider buying one of today’s canister vacuums do so because they have smooth floors as well as carpets. You typically don’t need a large and heavy upright for hard floors like tile, laminate, or linoleum. However, if you have thicker carpets then you are faced with a dilemma. Do you buy an upright and use a broom for the harder surfaces or get more than one machine? A better solution is to get a full sized canister that can handle all floors, and up until recently you didn’t have a lot of choices. The first thing you will notice when you get close to this model is it doesn’t have any wheels, but instead rides on a large ball. This eliminates the steering limitations of fixed wheels by giving a full range of motion in 360 degrees. 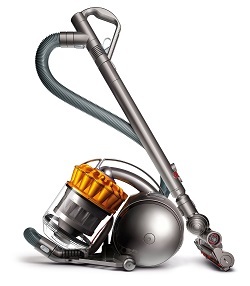 The heaviest part of any vacuum cleaner is the motor, and on this model the motor is positioned directly over the ball. This along with the central steering component give it a lower center of gravity for improved handling, even when pulling it across high pile carpeting. You will have no problems moving it around furniture, beds, and anything else in your path. You will save time as well by not constantly stopping to turn. Who Do We Recommend It For? Obviously, the Multi Floor has a lot of technology for a canister vacuum cleaner. All of the key components including the motor, electronics, and filter are built into the Ball, which also happens to provide the unmatched mobility. However, all of this might not be necessary for your home. It’s one of the best choices for large homes with multiple types of floors, including at least one room of medium to high pile carpet. And if your household has one or more pets then it is an even better choice as it has extreme suction power, a highly rated HEPA filter, and a quality turbine attachment that cannot get tangled with hair. If you want to read more about it and browse some consumer reviews, click here to visit our favorite ecommerce store.